Eggie is an electronic waste bin that improves the experience of disposal of tampons in public restrooms. It prevents women from cross-infection of blood-borne pathogens and avoids them seeing other people's waste. Eggie is an electronic waste bin that improves the NEITHER pleasant NOR sanitary experience of disposing tampons in public restrooms. This motion sensor activated, responsive waste bin involves no direct physical contact when it implicitly infers users' intention and offers effective feedback. It prevents women from and cross-infection of blood-borne pathogens and avoids them seeing other people's waste. 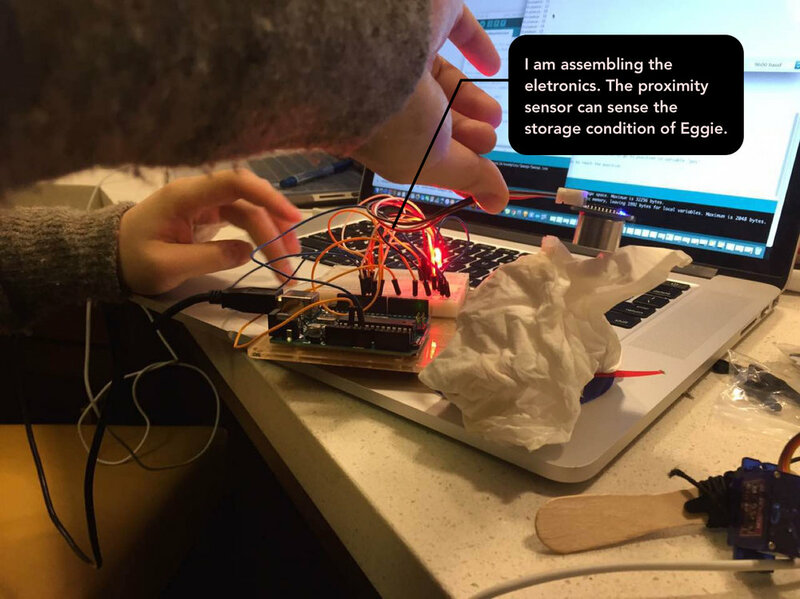 To craft Eggie, our team integrated electronic prototypes powered by Arduino into 3D models and laser cut artifacts. We got selected by the 2017 Maker Summit Award! YAY! One day, as part of my daily fun, I sketched a common, awkward moment in the public restrooms when people do not want to sit on the toilet seat. My designer friend, Shirley, had a good laugh at the illustration and shared the same concern that public restroom was such a problematic space that it harbors a multitude of design opportunities. After several coffee talks, we readily decided to craft a design solution to tackle one tip of the iceberg. How to improve the experience of disposal of feminine care products in public restrooms? We started from gathering inspiration and brainstorming concrete problems within public restrooms, and have identified issues like privacy, gender classification, unsanitary toilets, etc. Among all these, one thorny issue particularly intrigued us : how can we better the experience of disposing tampons for ladies in public restrooms? To our surprise, daily disposal of feminine care products in public spaces could have detrimental impact on both environment and human health (all genders), a fact to which most of us are oblivious. Not only do feminine care items clog the toilet and last forever in the landfill, they also constitute a hot bed for the spawning of bloodborne pathogens and germs that are easily carried away from the public restrooms into working spaces without anyone noticing. 1. "We don't want to see other people's waste!" 2. "We don't want to touch the lid." 3. "We don't want to walk out of the stall to throw the tampon." 4. "We know tampons should not be flushed down the toilet." Interestingly, leveraging media and education, all participants were aware that tampons should not be flushed down the toilet even though the product description prompted them to do so. In that context, the issue of clogging surfaced in our secondary research has already, to some extent, been alleviated. Mainly, their complaints centered around the waste bin, which, if present, was a tiny tin box attached to the wall of each stall. Based on all the above, we created a user journey map to uncover pain points and feelings of our users during the process. We then ideated on the ergonomics and features of our product as a substitute for the current waste bin for tampon disposal. We practiced the error analysis method, trying to assess and compare the strengths and weeknesses of each conecpt. Based on the feasibility and usability of each idea, we decided on polishing the egg-shaped waste bin concept. Tampons are tricky in the sense that they can stick on surfaces. Functionally, the curved surface of the egg shape features no angular corners or protrusions to stop tampons from falling down to the basin, which makes it easier for tampons to drop. On top of that, the metaphorical meaning of egg naturally evokes associations with femininity and protection that help establish emotional bonds with our target users. For 4 hours, we got stuck on how to completely block users' view from seeing other people’s waste and how to clean up the blood (that might stay on the platform) after each disposal. To open the lock, we spinned towards designs outside of the digital field when ideas of having a “screener-like” cylinder standing in the center and a "coffee-roaster-like" sweeping brush on the platform dwelled upon us. While the cylinder could make the gap in the back invisible, the sweeping brush could push the tampons down to the basin and meanwhile clean the platform. These thoughts stemmed from a traditional Chinese architecture called screener, and the coffee roasters at Starbucks Reserve Roastery in Seattle. 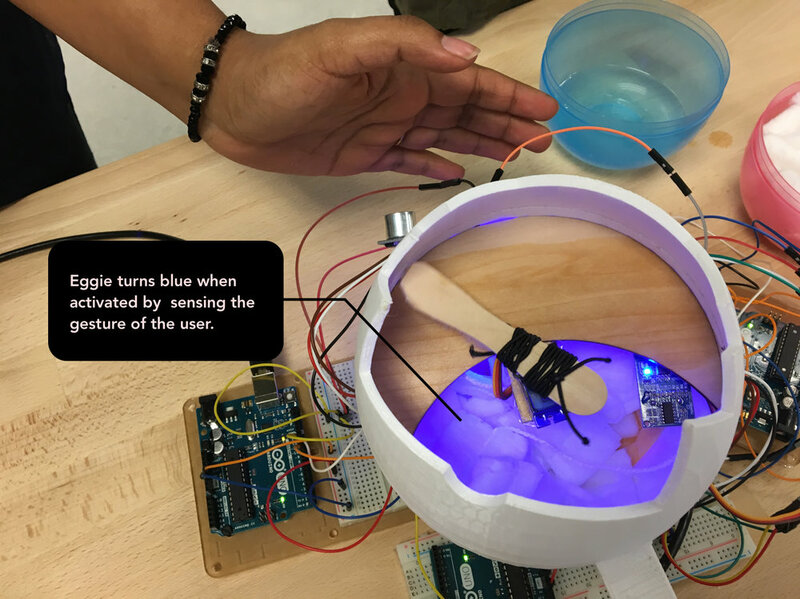 Eggie automatically opens itself when waving gesture is sensed and lights up blue to notify the users that it is now in use. Then users can throw the tampon on the tilted platform while the cylinder in the middle ensures that users will not see other people’s waste. The brush on the platform rotates and sweeps the tampon down to the basin and cleans the platform. Then Eggie closes and the blue light goes off. Whenever Eggie is filled up or out of use, it will light up red to inform users and staffs. With this visual instruction crafted by me below, we interviewed 6 people, including men, to gain their insights on the concept. For the final deliverable, we combined the eletronic prototype (Arduino) with the physical prototype (3D print & laser cut). We 3D printed the shell of Eggie, laser cut the platform, handcrafted the brush out from an ice cream spoon for the 1:2 physical model to evaluate its affordance and viability. Within 2 weeks, we built up the Arduino board with proximity sensors and Tower pro motor. At the same time, I picked up coding in C for Arduino and coded the commands for the interactions that we want to examine. We had several rounds of tests to ensure the effectiveness of the sensors and the usability of the physical prototype. We decided to evaluate the product in the studio exhibit and presented Eggie to members of the Design, Use, Build community at UW and experts from industry. Real tampons are provided for people to play with Eggie. Unfortunately, we did not include the cylinder part in the presentation due to budget concern, and instead conducted a Wizard of Oz to demonstrate how Eggie automatically opens using magnets. Primarily, we tested Eggie on female users to gain insights on how to improve it. Yet more importantly, men who have tested Eggie all reported that they appreciated how this test helped them better empathize with women. [Key Takeaways] Although we are perfectly aware that little things in our daily life are at times wrong, we hardly make efforts to change them. This project, has been a good start for me, to convert empathy into execution and more importantly, vocalize the need of women through design work. On the technical level, I have acquired more knowledge about Arduino during the self-learning process. For instance, painstakingly : } I learned that Arduino did not work well with linear motion unless additional motors and actuators are employed. 1. Add a sensor-activated, aromatic sanitizer to strengthen the self-cleaning function and clean the smell. 2. Add more light bulbs to increase the visibility of colored lights. 3. Build circuit chip to remove the wires.